B-Stock, This item has been refurbished and has signs of use, it may also have damaged packaging or no packaging. There is a limited warranty of just 28 days after the day of delivery. 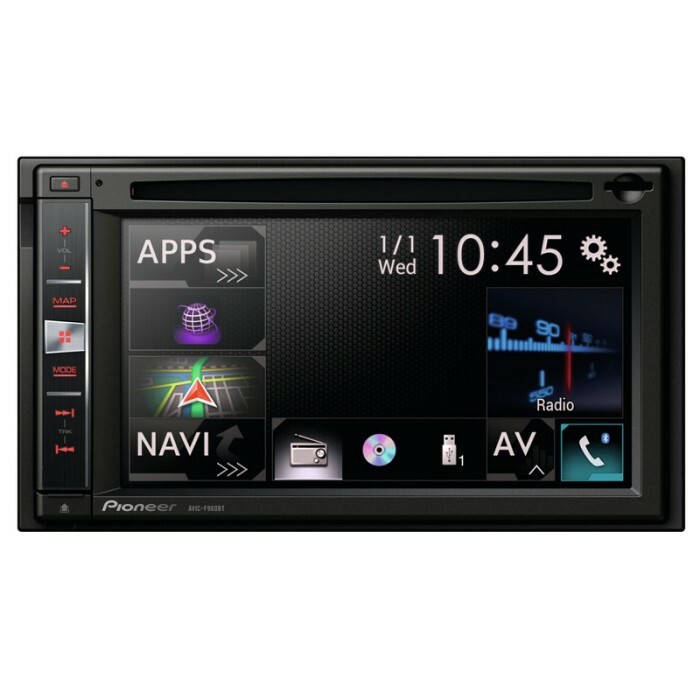 NEW 2014 Pioneer AVIC-F960BT double Din navigation system with built in bluetooth. 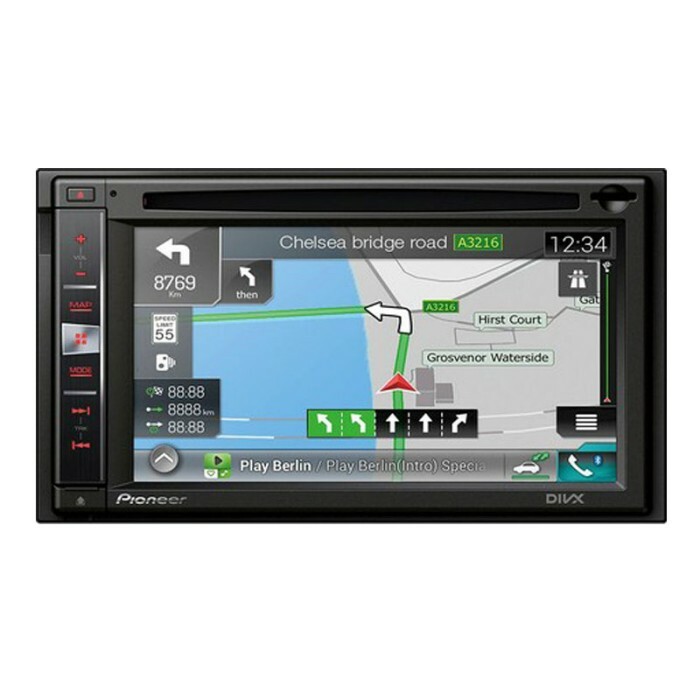 This Navgate AVIC Multimedia system combines high quality audio and video with intelligent navigation. Contenta all passengers and connect your smartphone with AppRadio Mode and MirrorLink and conveys what you feel like seeing or hearing. The AVICSYNC application offers access to services such as traffic, weather and more. You benefit from the map data and the latest information. The large touch screen of 6.1 'of the AVIC-F960BT, is designed to make the cut with his new and improved interface for the Android operating system. Like a smartphone, it is intuitive, easy to use, and safer operation your car. The AVICSYNC App for smartphone, will be available before the summer. Always be guided - no matter if you're listening to music, the radio or your passengers are watching a film on optional screens. Once you input your destination, our Sat Nav systems will continue guiding you, no matter the source. Customisable Key and Display Illumination: Match the button and display illumination with your car’s interior. Navigation Coverage: 45 European countries and 10.4 million kilometres of road:UK (incl. Northern Ireland), Germany, France, Italy, Benelux, Austria, Switzerland, Spain, Greece, Portugal, Denmark, Sweden, Finland, Norway, Ireland, Iceland, Czech Republic, Slovakia, Hungary, Poland, Monaco, Liechtenstein, Andorra, San Marino, Vatican City, Gibraltar, Croatia, Slovenia, Estonia, Latvia, Lithuania, Turkey, Malta, Romania, Ukraine and Bulgaria. Additional connector roads for Albania, Belarus, Bosnia and Herzegovina, Macedonia, Moldavia, Serbia, Montenegro. * Pioneer cannot guarantee the future compatibility of our products with any iPod (or iPod firmware update) which is released after the Pioneer product release. Had this fitted in my Bmw 1 series with a total face lift from your Manchester shop.Great finish excellent after sales service everything was explained before I left. Most important thing the price the cheapest around. Seen this in store over in Leicester as i was in the market for a new double din.The features on this unit sounded very appealing to me when I spoke to the members of staff there. I had the unit fitted there and then as it was more than fit for my purpose. The unit looks smooth and slick in my camper. Bluetooth is a great feature on it as it allows me to stream music as well as answer calls, the USB allows me to charge my phone unlike my last unit. The Sat nav works as it should, it ain't delayed like some other units I have seen. Very clear and user friendly. Like to say thank you for a great deal and service, also getting it installed with no notice! Had this Pioneer Satnav system installed at your ilford store in my Vauxhall Zafira. Really helpful and knowledgeable staff. Answered all my question and even done the install while it waited in the showroom. Satnav is spot on blueooth works really well and the ipod interface is very simple to use. Great unit at great price. Hi can you tell me what else I need for this stereo/ sat nav please. The car does not have sat nav at the moment. Will android phones work with it? Yes, this unit can work with Andriod phones. It can stream and answer calls vis bluetooth and play your music through the usb or aux connections. There is a new model of the F960bt now, it is the AVIC-F970BT or F970DAB which also features dab (digital radio). These units would be worth looking into as they will come pre-loaded with the latest mapping software. Pioneer AVIC F77DAB or F70DAB can be installed in a Ford Kuga (2014)? hi there yes this unit is fine to fit into your vehicle you will need some parts for it to fit will either be a round fascia or big square type. The display would disappear as the Pioneer unit wont support park assist. My car is Ford Kuga 2014 (New Kuga), equiped with park assist (no naviagation). I need to know if Pioneer work with existing parking sensors and display distance on screen. unfortunately there isn't a part available to allow the parking system to display on an aftermarket stereo system, but you would have to ability to add a pioneer reverse camera system which will give you visual and audio would come from the factory sensors. What is the latest model compatible with Ford Kuga (2014)? The latest version of this stereo is the AVIC-F970DAB. In order to install this into your car, you will need to purchase a complete installation kit: (CTKFD44C) aswell as a patch lead: (CTPIONEERLEAD). With the installation kit mentioned above, it will also come with a new door lock switch as it will need to be replaced. Is it compatible with the above model? This can be installed in your Vauxhall Corsa. You will need the following parts. I've got one of these in my Saab 95 Estate 2.0T and it works beautifully. I'm looking got change cars soon & want to know what cars this unit is compatible with? Looking at a Renault Laguna estate? Hi, the avicF960Bt is interchangeable in to most cars. However we would need to know what car and year to be able to advise you 100%. Yes the unit will fit a Laguna estate however we need to know what year the car is etc..
What bits would I need to fit to a 2003 model, I have no Bose but have the fibre optic MOST system so would need to bypass or replace the existing amp, also is there a facia available? hi there for your porsche you may need some specialists parts. both are options you can do bypass is the easier route. however its a special order harness yo would have to call to order it. many thanks. Yes this will be a direct replacement. You will need the following parts to install this in your Honda Insight. We do offer installation service. Hi is there any other wiring for putting in to a 2011 vw California. and does it come with connection for iPhone. Hi will this fit a bmw 1 series convertible e88 (2010)? i have seen this adapter fascia http://www.caraudiocentre.co.uk/product_m-connects2-ct23bm06_p-27328.htm also will i need any different cables? I'm living in New Zealand. Do you ship to here and if so what is the cost ? Also can NZ maps be loaded onto the unit ? hi there, you can check with the manufacture website to find out if they can load New Zealand mapping to this unit. and also call or email our main office team to get a quote for postage to NZ. Will this pioneer unit fit into my audi A4 b6 2001 model and if so what additional parts will I need. Hi yes the AVIC F960BT will fit your Audi A4. You will require some extra parts in order to make it compatible. You will need a fascia and a harness adapter. We have listed these parts below. The harness would depend if the unit is full amplified, half amplified, or bose. hi there for your merc vito van you will require a few parts to house this pioneer apple car play unit. i will list these parts below for you, inc the steering controls.